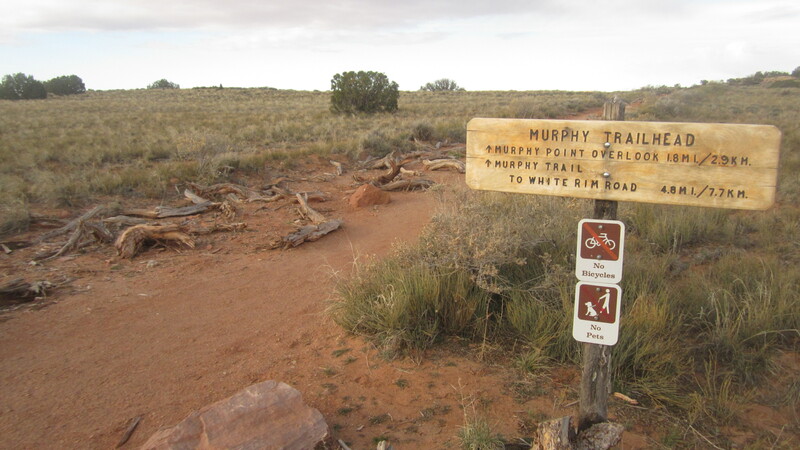 Murphy Point Trail is a 1.3 mile (out-and-back) trail that is flat, oftentimes sandy, and leads to a ledge with a +270 degree view of canyons, mountains, and weird rock formations. Murphy Point Trail is located in the Northern portion of Canyonlands National Park called Island in the Sky, and is maybe a 10-15 minute drive from the Visitor’s Center, but you should really stop at the overlooks along the way and experience that “holy crap the world is amazing” feeling that is always possible with incredible views of vast and complex landscapes. 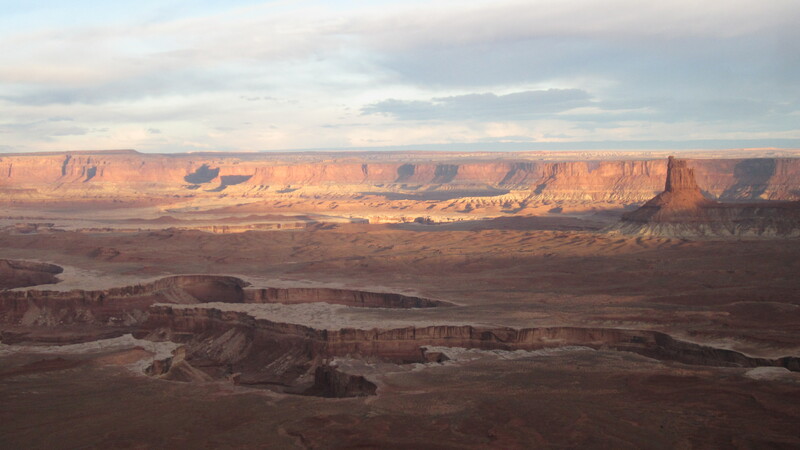 Note: Canyonlands National Park requires back-country permits for overnight backpacking that you can get from the ranger in the Visitor’s Center or online here: https://canypermits.nps.gov/index.cfm. From the trail, views of the dessert dominate the experience for about half a mile as I passed cactus, Mormon Tea (which is drinkable I learned), and sage. I saw a few deer, but little else as the wind was howling all around. 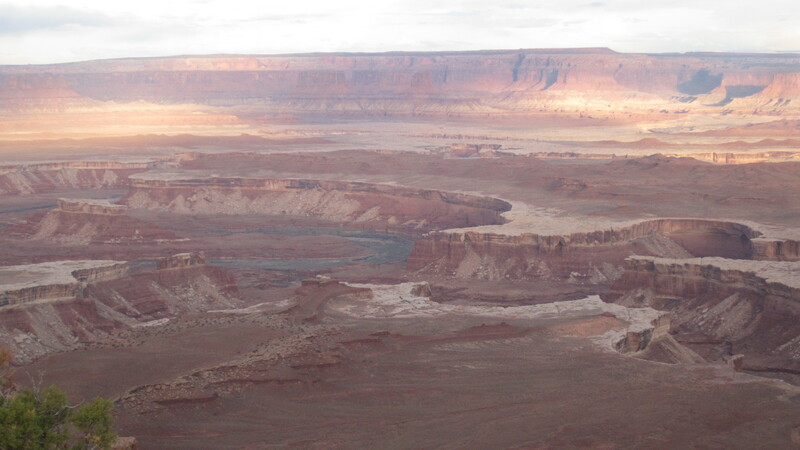 A high point in the trail gave a view of what was around me: canyon walls and mountains. Further ahead, I stopped at on overlook of … about 0.5 miles before from Murphy Point. I reached Murphy Point and the wind wanted to kill me. 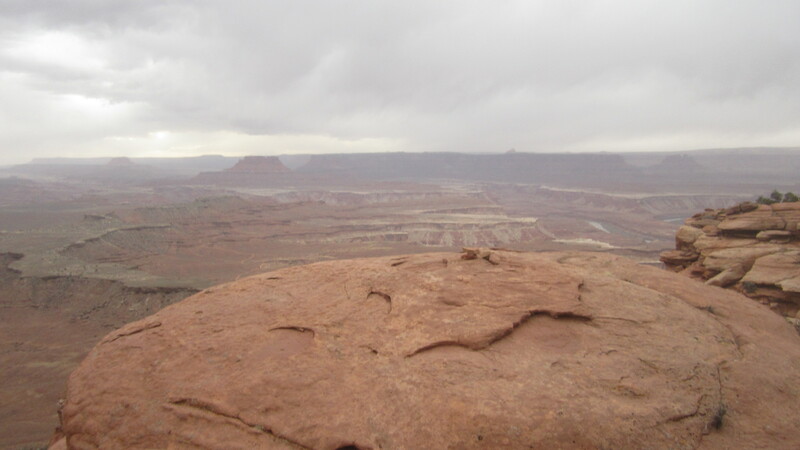 I walked out on the ledge, wind pushing against my pack, and my legs struggled to keep me from toppling over. I stood sideways to balance myself and walked when I felt breaks in the wind speed. I did not have the courage or stupidity to walk near enough to the tip of the ledge, but I stood with my walking stick planted firmly on the rock and let the wind charge my experience with danger. I felt alive. That night my tent poles bent around under the force of the wind until late. I laid on my back, read, and held the tent up with my legs. I could have slept in my car that night, but where’s the fun in that? No bikes :-(, but it’s short enough for a bike-break? A beautiful part of our country. Nice pics.